Since I made my Box of Chocolate Quilt last year I have been asked to teach a class at SMT to make this quilt. Although I really liked my original colours, they have been done several times now I thought for my class sample I would step out and add a modern twist to this quilt. Here is my original quilt as a reminder and here it is beside my moms quilt. Her colour scheme is the same even though she picked different fabrics. You can sure tell how much a quilt shrinks after being washed when you see mine (washed a couple of times) beside my moms (freshly minted). Mine is almost 4 inches smaller now! So after seeing this quilt done a few times in the same colour scheme that matches the name (two other ladies at SMT made the quilt as well), I figured it needed a fresh look. The pattern is so great and I thought for quite a while about what palette to use. I knew two things for sure; I wanted to add fussy cut prints in the centre blocks, and I wanted to feature solids. So earlier this week, after about two hours of pulling from my stash and trying different idea’s, this is what I cam up with! I was pretty pumped about it and I started cutting immediately! Seriously, check out the super cute couchs and the buildings and birds I used for the fussy cut squares! Since I will be teaching this class I wanted to have a small sample of the finished blocks so people have an idea how they go together. Also that would leave me with all the pre-cut pieces of the other components to use to demonstrate each step. So here is the demo from block one, Squares On-Point. Finished Square On-Point block, 12.5″sq. So there you have a quick tutorial in pictures of how to make the first block. You need 15 of these blocks for the whole quilt. Next I went ahead and made up two Star blocks for my sample. I accidentally stumbled upon the coral as an accent in this block and I really am quite impressed with how they turned out. Here again I’ve put together a little tutorial in pictures for the Star block! If you have difficulty following that pictorial tutorial, you should take my class at SMT! lol Or you could find yourself a copy of the November 2012 issue of American Patchwork where this pattern originally came from! Here is what the four sample blocks look like. Altogether this quilt has 30 blocks (5×6), so 15 each of block 1 and block 2. I hope you are intrigued! That was the point of this post; to whet your appetite to make one of these quilts yourself and to get you to sign up for my class at Sew Many Treasures! The class will be held over two evenings, October 31 and November 14. I know the October 31 date may be a problem, so if we have enough interest perhaps we can switch it to November 14 and November 28 instead. Please let me know if you up for it and what dates you would prefer. You can leave me a comment here or contact me on FaceBook. You can also call Sew Many Treasures at 403-528-8889 to sign up for the class. When you sign up you will receive the pattern and the supply list. 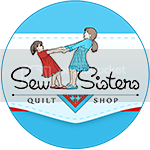 I’m asking that those taking the class have there fabric picked out and the pieces cut in preparation for the first class so that we can get right into the sewing!